check towards the bottom of the page. and discovered the force the Indian Ancestors had known all along. or simply staying home as an Armchair Tourist. Entitled “Holy Dirt, Sacred Earth: A Dowser’s Journey in New Mexico” the author sets out by asking the question: What is the magnetism that has drawn so many personalities to the Enchanted Land that special part of Northern New Mexico? D.H. Lawrence, Mabel Dodge Luhan, Arnold Rönnebeck, Georgia O’Keefe, Carl Gustav Jung, Dennis Hopper were among the cutting edge celebrities who openly spoke of it. Dowser and author Robert Egby with his partner Betty Lou started on a journey that quickly revealed that the Anasazi, the ancient ancestors of the Native Indians were acutely aware of both terrestrial and cosmic energies. The great immigration from Chaco Canyon to the valley of the Rio Grande River showed that wherever the Indians built their pueblos, they were always centered on earth energies known to dowsers as geospirals. European Christians came and built a cathedral and churches on the old Indian sites that contained geospirals. These earth energies also attracted and still attract people with creative and positive energies hence the enormous number of artists, writers, photographers, healers and movie stars that have flocked to the semi-desert region. In this book Robert explores Santa Fe, Los Alamos, Bandelier, Taos, Arroyo Seco, the Earthship Community, the 1,000 year-old Taos Pueblo who are keepers of the famous and sacred Blue Lake, and the Sanctuary of Chimayó, the so-called Lourdes of America from where the words “Holy Dirt” in the book title originated. On his way in an almost hidden mountain cave at 9,000 feet he finds an old Indian shaman in Spirit named Running Bear who still wields extraordinary powers of displaying historic events. It was the same cave visited by D.H. Lawrence and featured in one of his short stories. New Mexico appears to have a concentration of these geospirals discovered by the Indians, the pioneers and frontrunners. This book is the record of an adventure, an exploration, a search for earth energy. They say the gold-hungry Spaniards relentlessly searched for the fabled “Golden Cities of Cibola” and went away empty-handed, but the true gold of cosmic healing was there all along but they failed to feel it. This book may assist the would-be dowser to get started and learn to dowse his own landscape. In addition it will hopefully help the reader to understand the gentle art of dowsing. It may also intrigue veteran dowsers to explore new vistas and it will certainly allow the armchair traveler to read something about northern New Mexico in a new light –- the light of earth energy. The book is illustrated with 23 photographs taken by the author. There are other geospirals in the world and if you are inclined to the old Art of Dowsing you will find them says the author. The book also includes a basic lesson in using dowsing tools, pendulums and L-rods. Follow the ancient leylines, kivas and holy places and when you find one meditate on it for a few minutes and you will feel the energy revitalizing your body, mind and spirit. 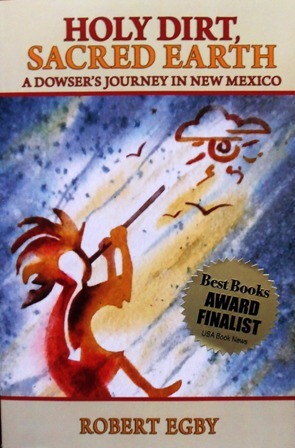 The book cover image shows Kokopelli, an Ancient Spirit Flute Player that can be found on many of the Indian petroglyphs in New Mexico. NOTE: On October 17th USA Best Books announced that Holy Dirt, Sacred Earth: A Dowser's Journey in New Mexico" had been selected for a "Finalist" award in the New Age Non-fiction Category in the National Best Books 2012 Awards. Read the News Release. Robert Egby is an author and novelist who lives in upstate New York and Pemberton, New Jersey. He has written books on higher consciousness and spirituality and has also published a lengthy autobiography and five dramatic fiction thrillers. His books can be found on his website at Different Books for Different People, Amazon.com, and good bookstores everywhere. For ebooks check Amazon Kindle. The author is available for book signings and speaking engagements that include color slides of the places featured in “Holy Dirt, Sacred Earth.” Representatives should phone 609-351-5878. Robert's illustrated Power Point show/talk is available free of charge to metaphysical and healing groups in central/south New Jersey, southern Pennsylvania and northern NY State. The presentation has been given to the Taos Noetic Sciences Community, Willow Bender Dowsers at Los Lunas, New Mexico, Canadian Dowsers in Kingston, Ontario and at Chaumont, northern New York. Please call 609-351-5878. We do have books available for purchase at such events. AUTHOR SIGNED BOOKS: Each of Robert's books are available signed by ordering through Paypal. In the instructions explain who you wish the book or books signed for. Each book is $12.99 with FREE shipping in the US and Canada. Most orders are mailed the same day as they are received. Thanks.